Sadly, the answer to that question is “Yes.” That’s what my friend, Janet Thompson, says. She is the author of the newly-released book, Forsaken God? Remembering the Goodness of God Our Culture Has Forgotten. Janet says we, too, can forsake God without realizing it by forgetting the good things He has done for us. Today’s culture is quickly forsaking and forgetting the goodness and power of our Great God. The Bible describes the potential destruction through all generations to people who forget God. The dangers are paramount. We read the Old Testament and lament at how forgetful the Israelites were of God’s goodness. Every time He did something good for them, they started grumbling that they needed something else. And are we any different today? and He offered them a land flowing with milk and honey. We wonder at how the Israelites could be so blind and ungrateful. Why couldn’t they trust that a God who provided and protected them in the past, would do the same in the present and future? But their memories were short. As often as Moses and God tried to help them remember, still they forgot. And at great sacrifice. The original generation freed from Egypt never got to see the Promised Land because they doubted God’s goodness. Even Moses wasn’t able to enjoy its beauty because at a crucial moment, he took matters into his own hands and forgot that God was in control. We would never forsake God! But wait . . . don’t we forget too? God has done amazing things in our lives, but when the next crisis arises, we panic that He might not show up for us this time. Or when prayers are answered, we might take credit ourselves or offer praise to someone else instead of giving God the glory and recognition He deserves. We never intentionally forsake God, but if we’re honest, we do unintentionally forget him. So let’s agree that forgetfulness will stop with our generation. We live in a world today that is quickly trying to eliminate God from the public square and even in the private domain. Christians need to help a lost world remember God and that starts with remembering Him ourselves. 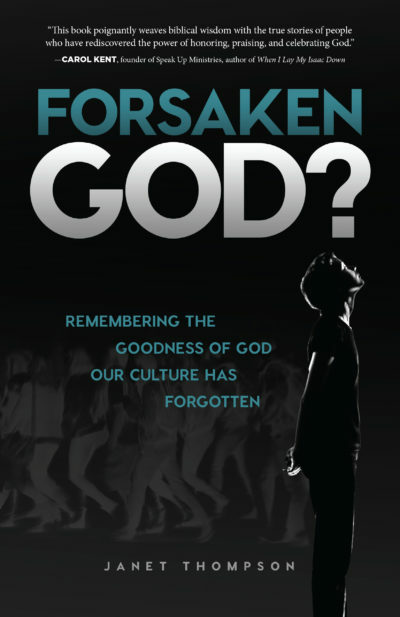 In my new book Forsaken God? 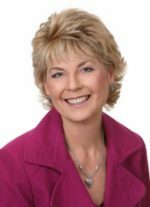 : Remembering the Goodness of God Our Culture Has Forgotten, there are suggestions for ways to remember all that God has done in your life and, then share that memory in your sphere of influence. One effective way is to share our testimony. As a Christian speaker, I give parts of my testimony every time I speak. “Feed my sheep” is my testimony of a time when God clearly spoke those words to me. When I said an obedient “OK,” He went on to reveal that the sheep were women and feeding was mentoring. That was 20 years ago, and today God has taken Woman to Woman Mentoring around the world as women enjoy the blessings of being in Titus 2 mentoring relationships. I still stand in awe as I write that story, and every time I tell it from the stage. I will never forget how God used me to start a worldwide ministry, and I give Him all the glory for the blessing it has been to so many. But you don’t have to be a speaker to share your story. Someone today needs to hear how Jesus changed your life. A hurting world needs the Christian world to tell them the source of our joy and hope. Mentoring is a great place to share our testimony to encourage others to know the Jesus of the Bible. What are some ways that help you remember God’s goodness?